Designed to fit fuller calves, these silky-smooth Healthy Steps™ wide calf compression socks provide moderate compression ideal for everything from daily wear to car trips and airline travel. Graduated 15–20 mmHg helps promote blood circulation and relieve swelling, fatigue, edema and discomfort for healthier legs and feet. 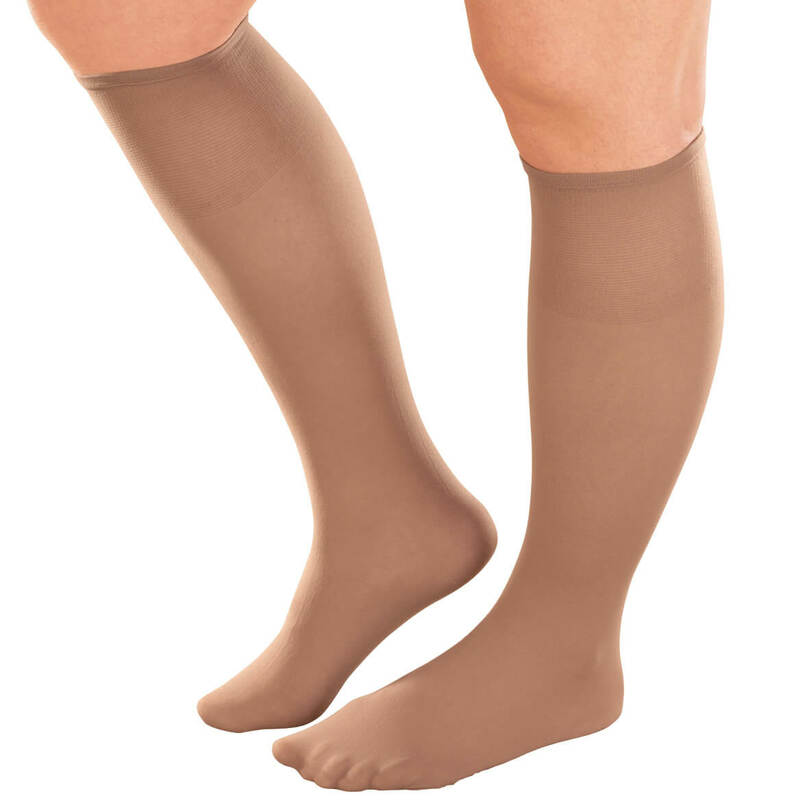 Knee-high support stockings feature a 1” comfort band for a secure, non-binding fit. Perfect for men or women, they fit calves up to 20”. Circulation socks made with 82% nylon/18% spandex. Machine wash warm; tumble dry medium. These half-socks will keep the front of your foot dry and comfortable in clogs,slides, or mules. Back of foot stays bare for sling back, backless styles. Gentle elastic; 85% white cotton and 15% nylon blend. Machine wash. Two pairs per package. One size fits most (women’s shoe sizes 5 to 10 1/2). Made in USA. Designed to fit fuller calves, these silky-smooth Healthy Steps™ wide calf compression socks provide light compression that’s comfortable enough for daily wear. Graduated 8–15 mmHg helps promote blood circulation and relieve swelling and discomfort for healthier, happier legs and feet. Knee-high support stockings feature a 1” comfort band for a secure, non-binding fit. Perfect for men or women, they fit calves up to 20”. Circulation socks made with 82% nylon/18% spandex. Machine wash warm; tumble dry medium. 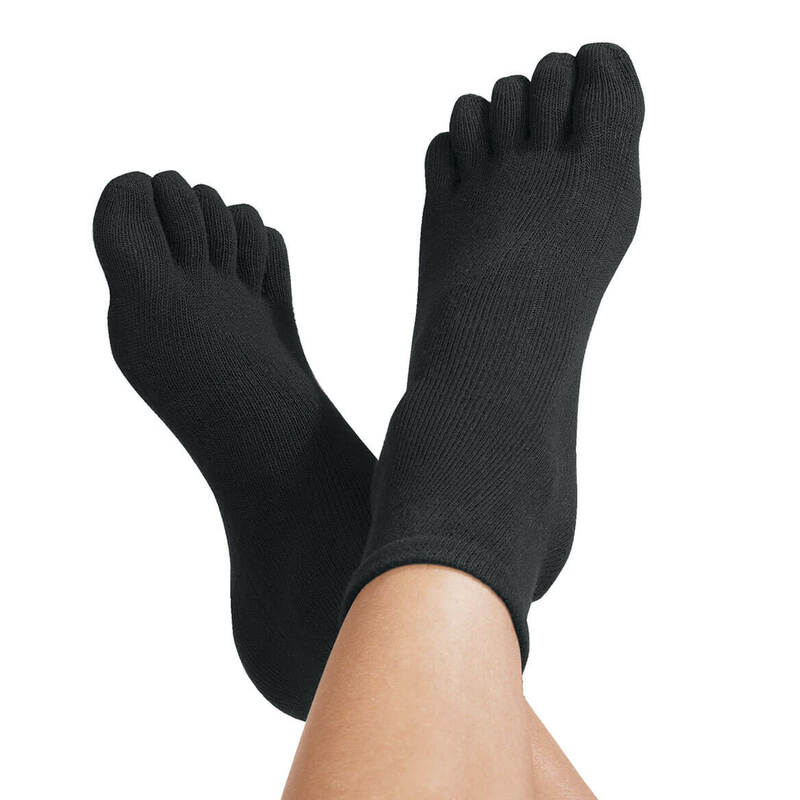 Ultra-soft toe socks keep feet warm, dry and comfortable, with separate toe compartments to help prevent overlap, friction and irritation. Specify size: medium (fits women’s shoe sizes 6 – 11 or men’s 6 – 9) or large (women’s 11+, men’s 10 – 13). Machine wash. Toe socks are 90% cotton/10% spandex. 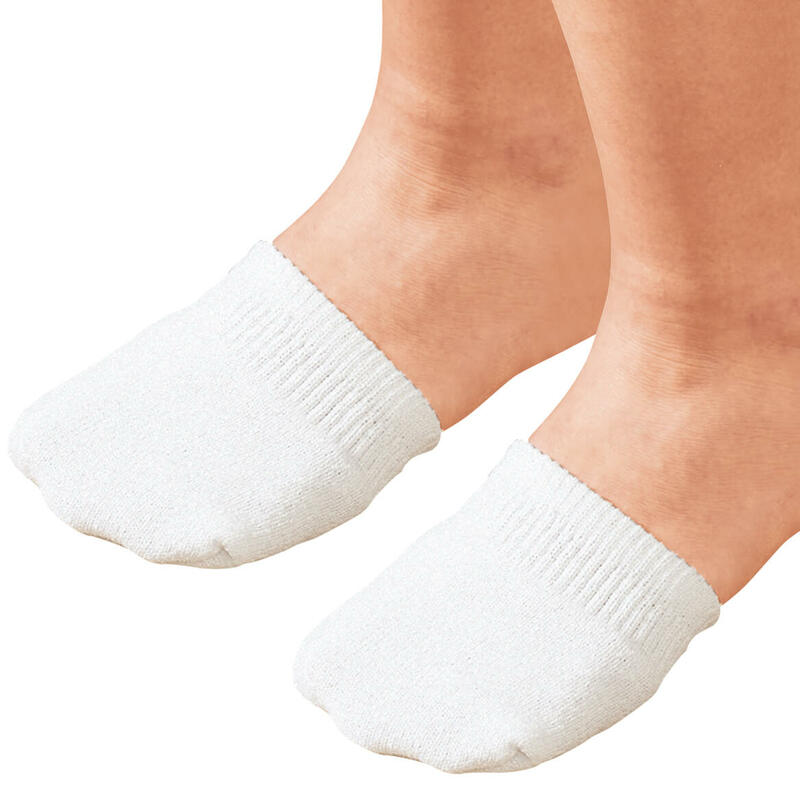 Healthy Steps™ wool diabetic socks combine the comfort of wool socks with protection for diabetic feet. Designed with 40% wool composition, our exclusive circulation socks keep feet warm and dry as they wick away moisture to help prevent infection and other foot problems. 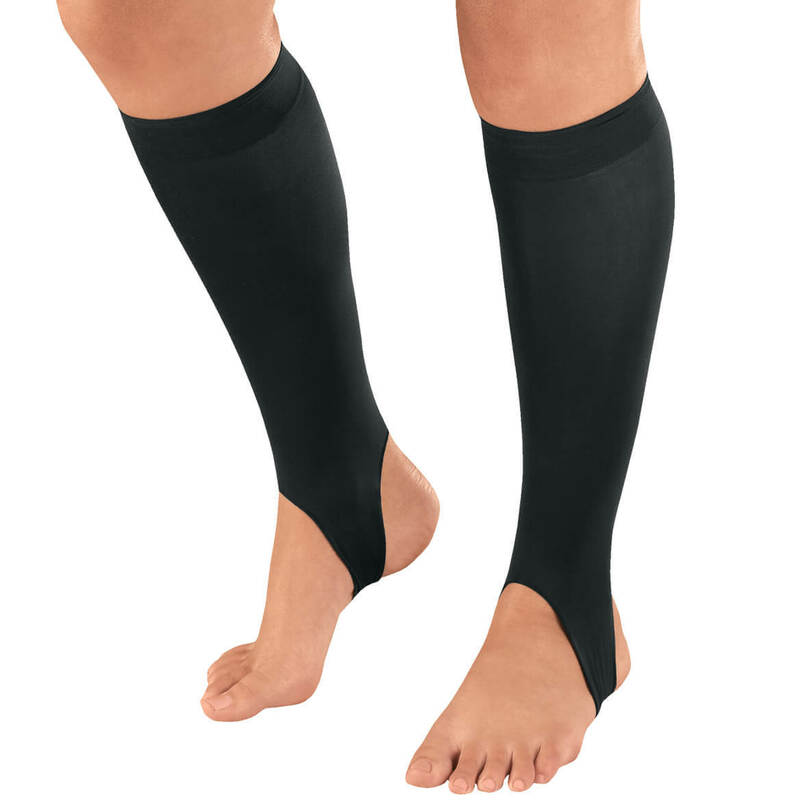 Minimal compression helps promote circulation without binding, to help relieve slight swelling, fatigue and neuropathy. Includes 2 pairs of crew-length socks. Choose from 4 sizes. 40% wool/25% polyester/25% cotton/10% spandex. Machine wash warm; tumble dry. Made in USA. 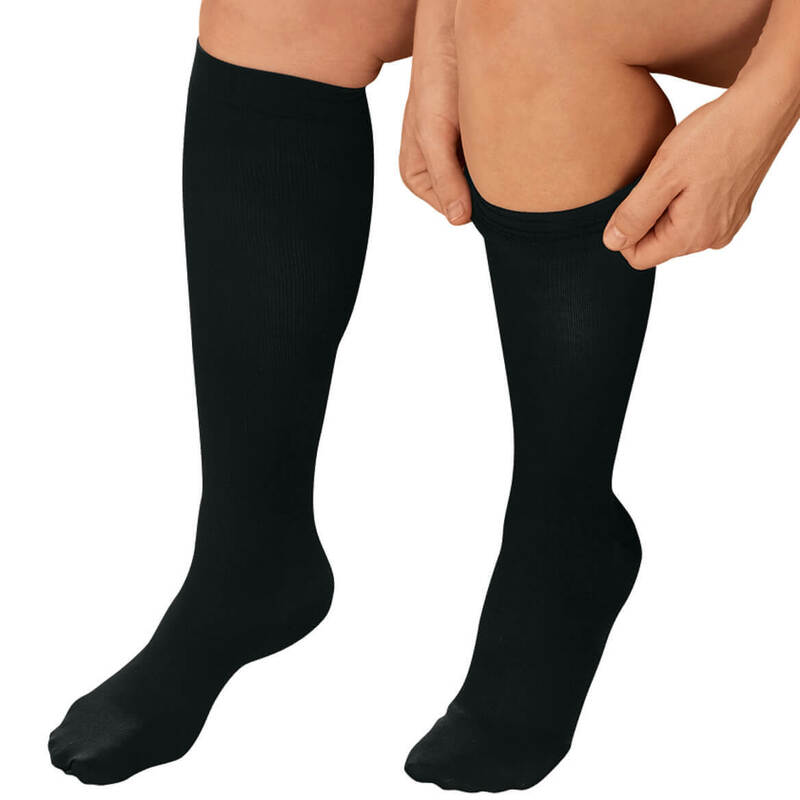 Women’s compression socks (15-20 mmHg) help reduce fatigue, swollen ankles, varicose veins. 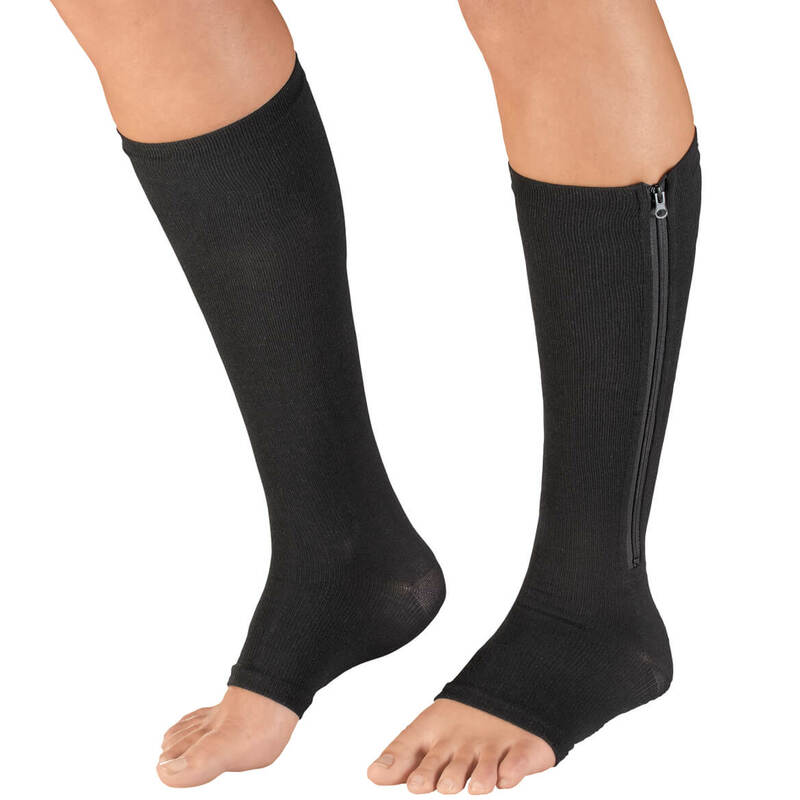 These compression support socks are made of Nylon, Lycra® and spandex and are machine washable. Women’s medium fits shoe sizes 5 1/2-7 1/2, large fits 8-10 1/2, XL fits 11-13. Surround your feet with cushioned comfort designed to help boost circulation. 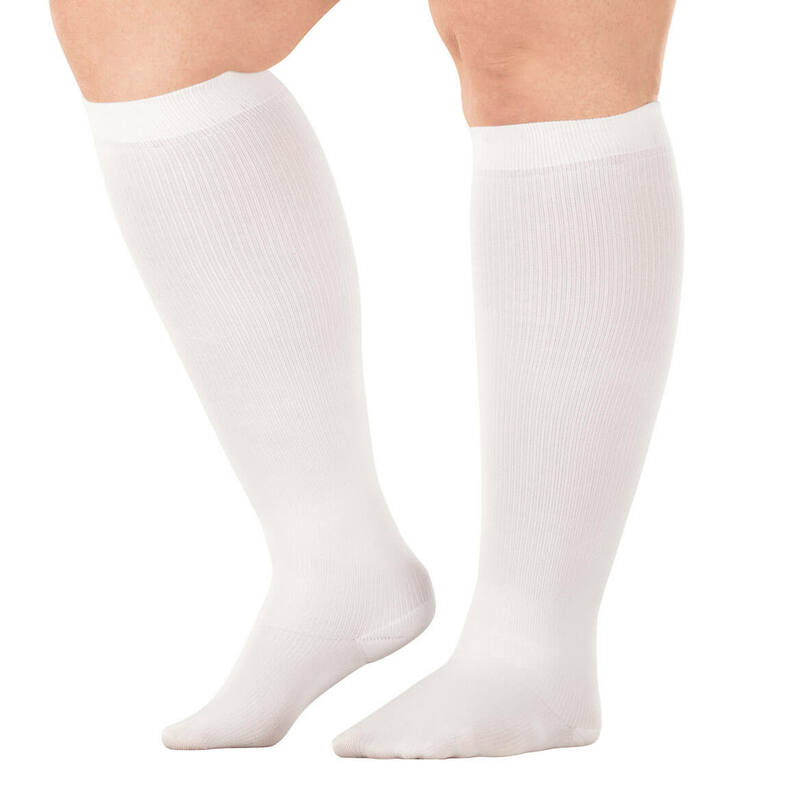 Jobst® SensiFoot Diabetic Crew Socks with mild 8–15 mmHg compression help promote blood circulation for healthier feet and legs. 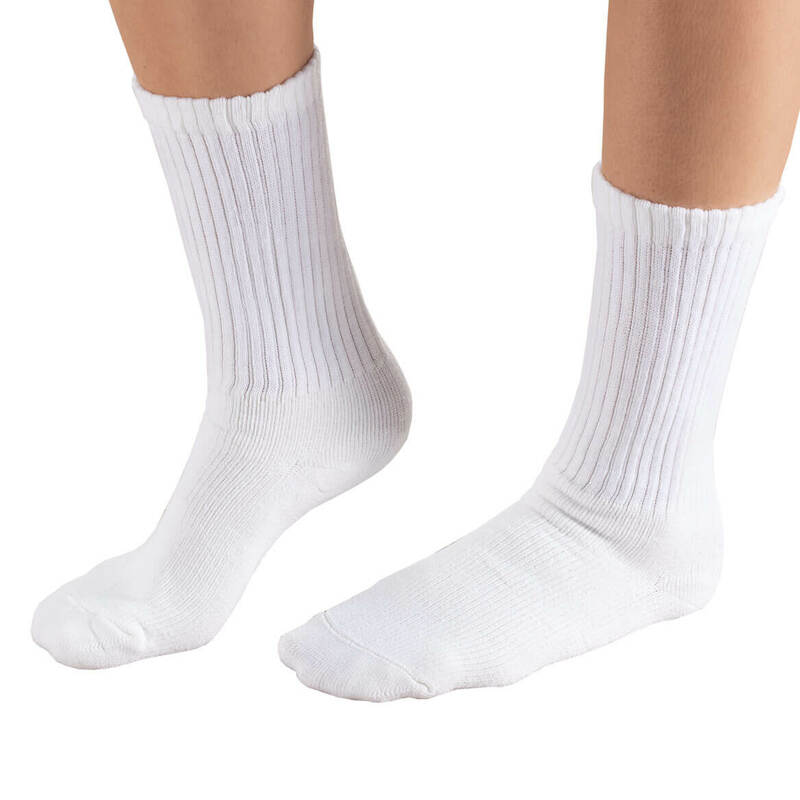 Soft, thick, moisture-wicking diabetic socks feature an antibacterial, antifungal finish to help prevent germs and odors. With a non-binding top, non-irritating seamless design and extra padding in the heel and toe, every step is comfortably cushioned. Specify size. Compression socks made with 80% acrylic/17% nylon/3% spandex. Machine wash warm, no bleach; tumble dry low temperature. Non-binding women’s extra wide knee high socks stretch to fit calves 19″ to 25″ comfortably. 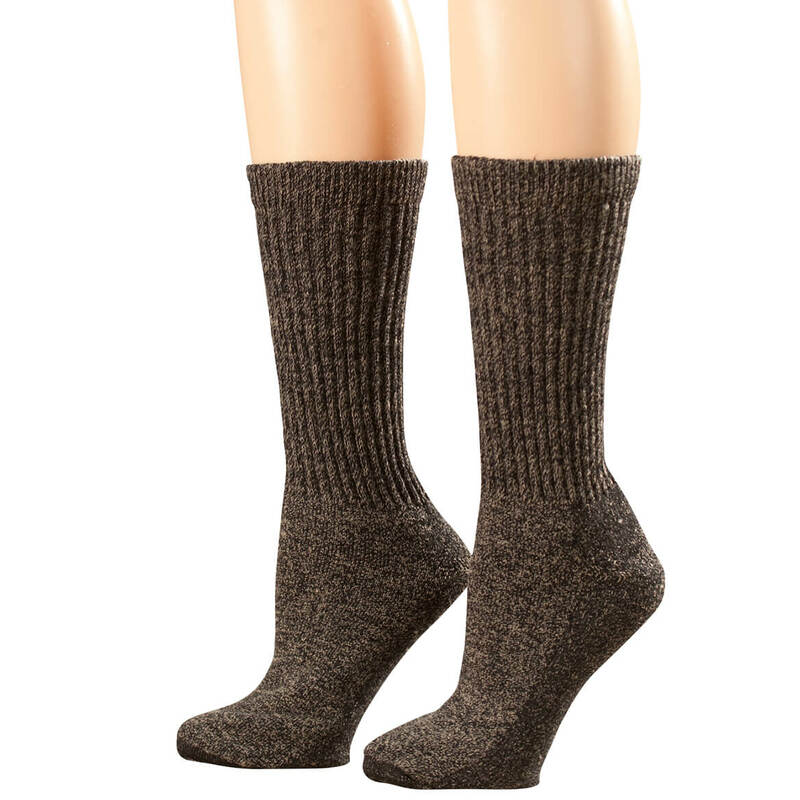 Pack of six knee high socks has two pairs each in beige, tan and black. 98% nylon/2% spandex is hand-washable. Made in USA. Stretchy knee high compression stirrups soothe legs and relieve pain. Comfortable and lightweight, compression stirrups are easy to slip on while leaving the feet pressure-free. Tan. 75% nylon/25% spandex. Hand wash. Medium fits calves 13″-16″; Large fits calves 17″-20″. USA. Treat your legs to soothing compression with magnetic zipper compression socks leg circulation and reduce swelling and fatigue. Magnetic therapy helps promote natural healing, melatonin production and peaceful sleep. Zipper pull helps ensure easy on/off, even for those with limited dexterity. Soft, durable zipper compression socks hug ankles and calves, with a sleek toeless design that’s comfortable under clothing. 54% cotton/36% magnetic polyester/10% elastane. Hand wash cold; tumble dry low. Do not iron, bleach, dry clean or wring.